Ok, so this isn't my picture, because I didn't have my camera. 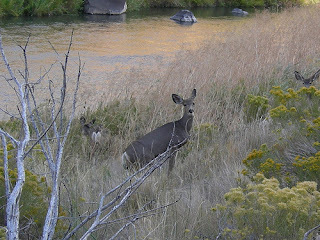 But, this is just what we saw crossing the road in front of us on the way home from church today- 4 mule deer. Pretty cool! OK fine! We'll move to Bend after dental school! :) I'm now officially jealous. I love your countdown for trader Joe's. Just yesterday I was thinking to myself....when is that place going to open.